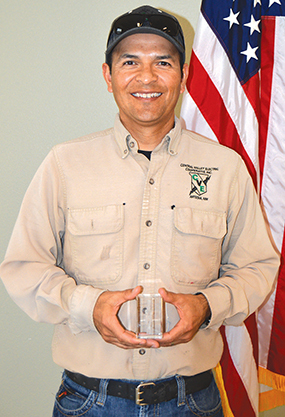 Central Valley Electric Cooperative (CVE) wishes to congratulate Ramon Barrera, CVE Substation foreman, on his receipt of the Long Rope Safety Award. Barrera was recognized by his peers as a leader in safety on April 20 at the co-op’s monthly safety meeting. CVE describes Barrera as always willing to lend a hand to assist any department and says it is important to him to ensure any and every job is done correctly and safely so that everyone goes home at the end of the day knowing they have done a good job. “He is one of the smartest and safest field employees I’ve worked with in all my years at CVE,” commented one colleague. The Long Rope Safety Award is presented to individuals with a positive attitude toward training, communication, and safe work habits. They are leaders and continually demonstrate a culture of safety in their challenging industry. The award is dedicated to all linemen in New Mexico who have been killed or injured on the job. The employees, management and board of trustees of Central Valley Electric Cooperative would like to congratulate Barrera for being a good representative of everything this award stands for.